Deep pink buds open to double flowers of creamy yellow with deep pink veins late mid-season. 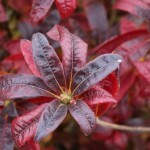 The foliage has tinges of red during the summer. The fall color is a deep burgundy red. 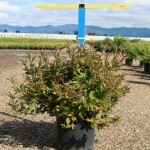 The small mounding form is excellent as a specimen or in mass shrub borders. 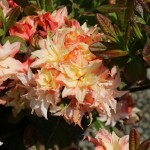 Prefers moist, well-drained acidic soils and full sun to part shade.